I got my usual thrill of excitement when we woke up to see the coast of Norway. 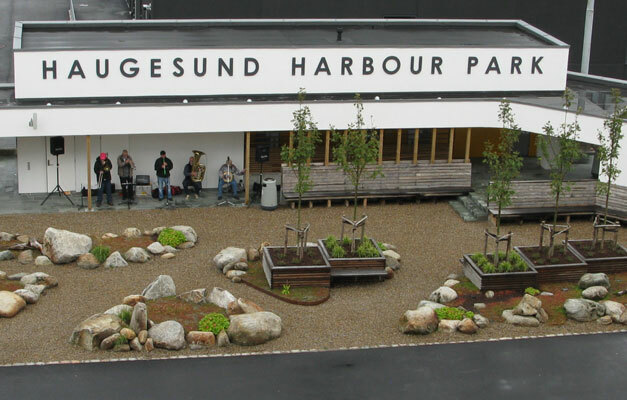 When I used to travel over to Norway 50+ years ago on the Bergen Line we used to stop sometimes at Haugesund, but there was never enough time go ashore and explore and I knew little about the area, so I had booked us on an organised tour for the afternoon. 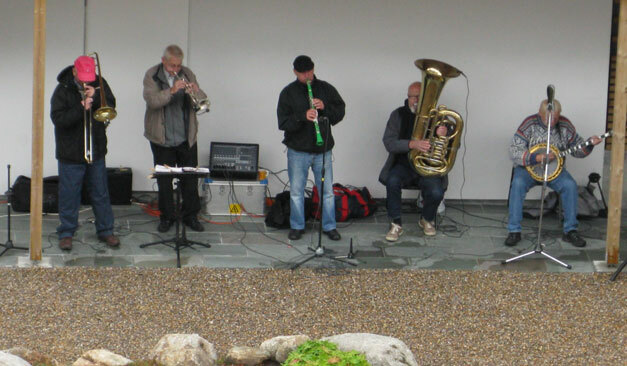 We arrived in Haugesund just before lunch and were welcomed by the town jazz band and girls in national costume. After lunch we set off on our tour. Our guide was Celia and as usual she was excellent both showing us the sights and giving a potted history of the area. I had not realised before what an important part it had taken, particularly the Viking period, in the history of Norway. We drove first around the old town on Risoy and then over the bridge to the main shopping streets. 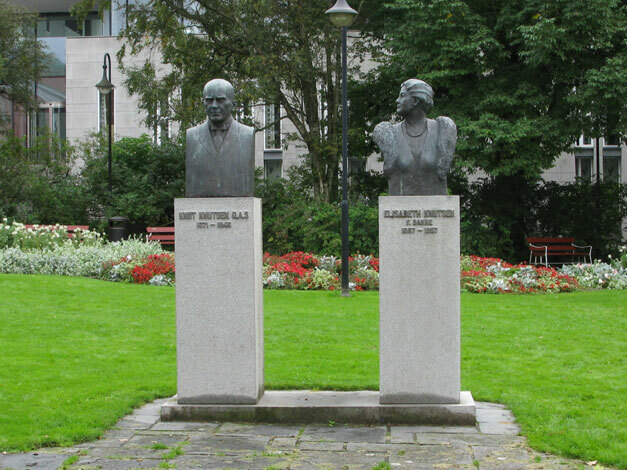 Our first stop was at the town hall and park, which had been given to the town by the shipowner Knut Knutsen andd his wife Elizabeth, who were great philanthropists. 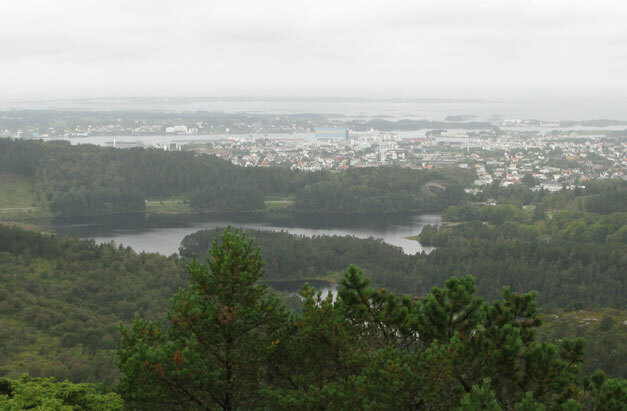 After leaving the town centre we drove out to an area which has been preserved for the enjoyment of the outdoor pursuits for which Norwegians are justly famed. We drove up a steep narrow road, which is prohibited to private mechanised transport. 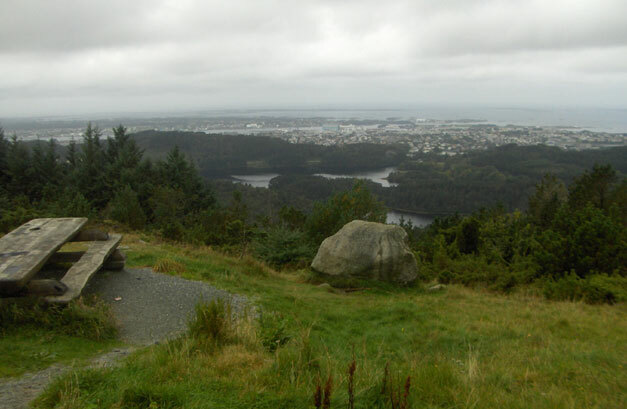 At the top we had a magnificent view over Haugesund and its surrounds. From there we drove to Haraldshaugen to see the monument erected to mark the unification of the states of Norway by Harald Fairhaired in 872. This is a 17m high obelisk and is believed to mark Harald’s last resting place. 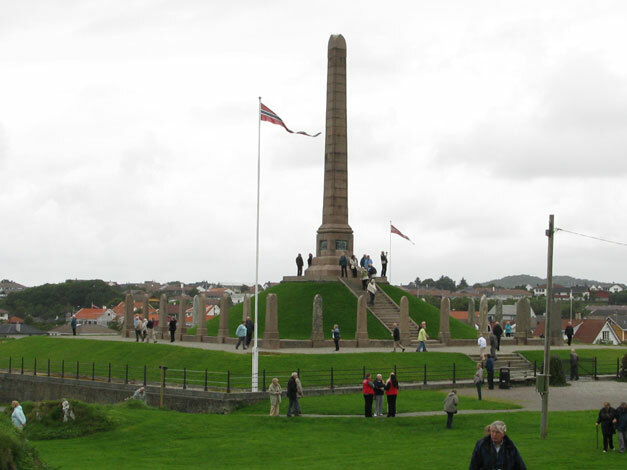 The monument is surrounded by 29 stones to represent the 29 regions which were unified. 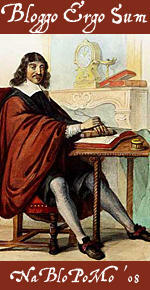 Olav Tryggvesen brought Christianity to Norway in the 12c. in the reign of Hakon the Good. The area was the home of several Viking kings, and stone monuments, construction artefacts and sagas tell us much about the Viking era. Contrary to the tales we had in our history books they were not only “rapers and pillagers” but great seamen, fishermen, farmers and traders. They are believed to be the first Europeans to reach America (beating Colombus by several centuries!) and they traded in the East and Mediterranean as well as Britain and Ireland. They travelled, of course, in the famous long boats, which could reach incredible speeds. An exact replica of a longboat has been built using the same methods and materials and is hoping to sail around the world. Womens Suffrage came to Norway 100 years ago, largely due to the efforts of two spinster ladies (I think called Hanna and Babatka) who wanted to become ship owners. They managed to buy a ship through a male friend and became very successful business women. Another famous business lady was Amanda. It is claimed that women have always run things since Viking times when their menfolk were awy so much. 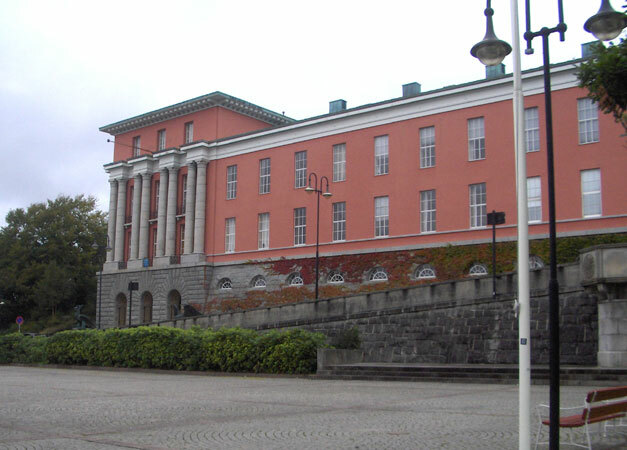 The modern city of Haugesund is relatively new. It started as farmland and then the herring came and the herring industry was founded which led to the boat building industry and now of course the oil, gas and renewable energy. On the way back to the ship we saw a painting on a wall of Morris Rabinowicz. A Jewish immigrant who settled in Norway and built up a large clothing business which was very successful until WW2 when the Nazis deported him and his family to the concentration camps. The painting remains as a memorial and to remind people that they can start with nothing and build up a successful business. This had been such an interesting tour and I had learned so much about Haugesund and Haugalandet. Again, the photos are terrific. 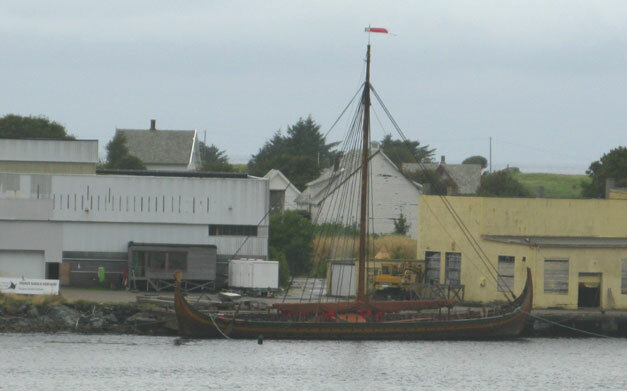 A note on those longboats – you may know that the “hull speed” of a sailboat is determined by the length of its hull. It makes perfect sense that those longboats would be among the fastest old vessels – just look at that length! Interesting that you’re talking about Vikings, and I’m thinking about Vikings. When I leave on my trip to the Midwest next week, one thing I’m going to see is the Heavener runestone – which some take as evidence that the Vikings made it to Oklahoma! I knew that the Vikings went to America but hadn’t realised that they got as far as Oklahoma. What amazing guys they were!